With this app challenge, we are empowering developers to extend the traditional user experience with the inclusion of our industry-leading APIs. 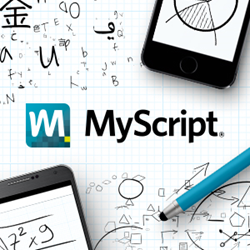 MyScript® is pleased to announce the MyScript App Challenge, an online hackathon for developers. Participants are invited to build applications that demonstrate practical and innovative use cases where handwriting technology can be leveraged to great advantage for the end user. The competition will award $20,000 in prizes to contest participants. For this global competition, developers are invited to create an app using APIs available in the MyScript Cloud Development Kit (CDK) or Application Toolkit (ATK). These tools are available free of charge for non-commercial use on the MyScript Developer Program web site at http://dev.myscript.com. Utilizing the MyScript APIs, developers can combine in one application the use of multiple handwriting recognition engines including text, math, shape, and music. Application submissions will be judged on four main criteria including effective use of the MyScript APIs, app design, utility of use case demonstrated by the app, and innovation in the use of handwriting recognition. The competition will be judged by a panel of industry experts. The grand prize winner will receive $10,000. First runner up will receive $5000 and second runner up $3000. MyScript will also host a popular vote whereby the public can vote for their favorite submission. The winner will receive $2000. The MyScript App Challenge is hosted on Devpost and submissions are now open. For more information regarding rules and eligibility, visit http://myscript.devpost.com. MyScript is the acknowledged market leader in accurate, high-performance handwriting recognition and digital ink management technology. MyScript technology combines digital ink management with easy searching of handwritten text, as well as the accurate recognition of complex mathematical equations, geometric shapes and music notation. MyScript solutions are available on all leading desktop and mobile operating systems including Microsoft® Windows®, Apple® Mac OS®, Linux®, iOS® and Android™. With nearly 100 languages supported and a truly international team, MyScript serves customers worldwide from its headquarters in Nantes, France, and regional offices located in China, Japan, Korea, and the U.S. For further information, please visit http://myscript.com.